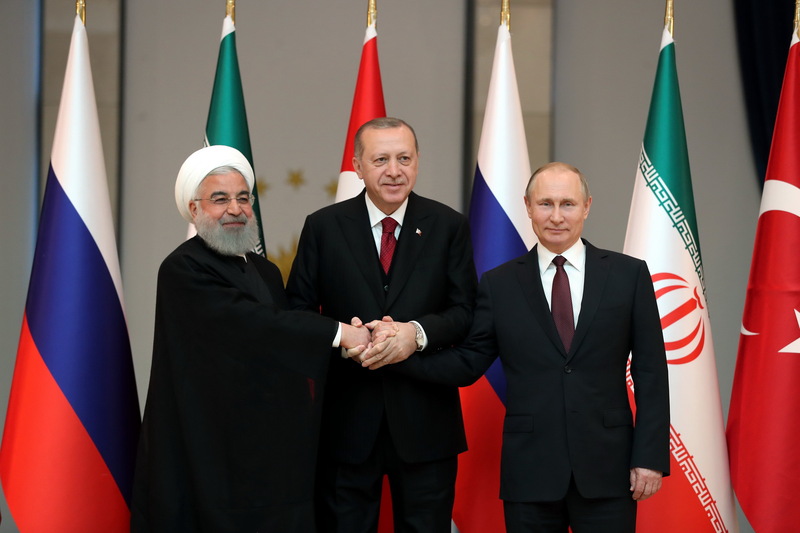 Presidents Hassan Rouhani, Vladimir Putin and Recep Tayyip Erdogan met in Tehran on September 7 to discuss the final battlefront in Idlib province and Syria's political future. The summit is their third on Syria. In November 2017, they met in Sochi, Russia, and in April 2018 they met in Ankara, Turkey. Their countries have played the leading roles in the Astana peace process, a series of talks launched in 2017 to complement to those held in Geneva. Iran and Russia are committed to destroying the jihadist groups based in Idlib. Syrian forces are set to launch an assault in the northwest province. But Turkey, which has outposts there and connections to some of the rebel groups, has been concerned about the humanitarian fallout and the possibility that civilians flee towards its border. “A military solution there will cause catastrophe,” Turkish Foreign Minister Mevlut Cavusoglu warned in August. “Civilians will be harmed. Where will the 3.5 million civilians go?” Between 2011 and mid-2018, Turkey has absorbed some 3.4 million Syrian refugees, whose presence has increased social and economic pressures. During the Tehran summit, President Putin called for the establishment of a U.N.-monitored constitutional committee. President Rouhani demanded that U.S. forces withdraw from Syria. The Tehran summit’s joint statement reaffirmed several points that were made in the previous tripartite meetings. 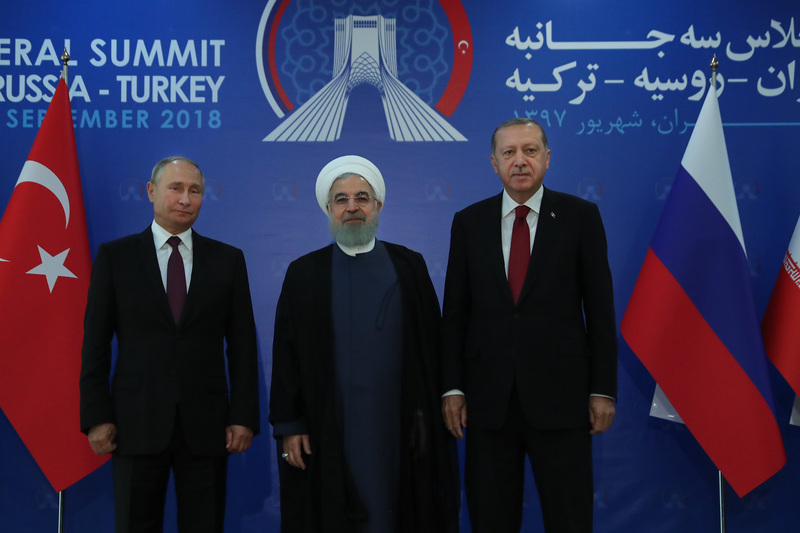 The three leaders emphasized the need to eliminate terrorist elements, to advance the political process towards a settlement, ensure Syrian sovereignty, and protect civilians. Just before the presidents were about to pass the final statement, Erdogan proposed including a ceasefire in the text. Putin said that adding such language was not possible given that the armed groups were not represented at the table. He warned that the militants in Idlib were planning “provocations” that might include the use of chemical weapons. Putin and Rouhani said that terrorists needed to lay down their arms. A ceasefire was not included in the final statement. The following are excerpted remarks by the three leaders from the summit and since their April 2018 meeting. “The Islamic Republic of Iran’s presence in Syria is at the request of the Syrian government and to fight terrorism in the country, and the continuation of this presence will be on this basis. At the same time, this presence, neither in the past nor in the presence, has not been -and will not be- aimed at imposing its opinion, and will support the will of the Syrian people as a friendly nation. “On the other hand, combatting terrorism requires a comprehensive approach by taking into account all aspects of this unpleasant phenomenon. With the same viewpoint, the fight against terrorism in Idlib is an integral part of the mission of restoring peace and stability to Syria, but this combat must not hurt the civilians and lead to the policy of burning land. We are fighting for peace, and war for war is, in our view, the wrong way that groups and terrorist regimes have taken. The ultimate goal, be it in Syria or in the whole region, is peace, but to achieve a lasting peace we have no choice but to fight terrorism. “No plan for combatting terrorism can be complete without paying attention to its origins. Those responsible for occupation, terrorism, aggression, foreign interference and discrimination, such as the United States and the Zionist Regime, and some other sponsors of terrorism, cannot change their position from the accused to the plaintiff by hurling accusations. The Zionist Regime, as an occupational regime that is based on ethnic and religious discrimination, whose existence has been formed with occupation, aggression and instability, cannot claim to be fighting terrorism, and the immediate withdrawal of this occupying regime from the occupied territories of Syria is the common desire of all the Syrians in accordance with international conventions. “Obviously, we should not expect the US administration, with its illegal presence in Syria and acts of aggression and occupation and supporting of the apartheid Zionist Regime, to play a positive and constructive role in this regard. The United States’ illegal interference in Syria is not consistent with any international law and it adds to the existing problems in the country and poses a serious challenge to achieving lasting peace in Syria. “Dear colleagues, the continuation of the presence of hundreds of thousands of Syrian refugees in neighbouring countries will have a negative impact on them; therefore, we should provide the ground for their immediate return to their home land. The international community should help the Syrian government to rebuild Syria. The return of refugees and reconstruction of Syria will undoubtedly contribute to the ceasefire and national dialogue and accelerate the process of reconciliation in the country. “In any solution to the future of Syria, the Syrian people have the main and ultimate role, and the efforts of the United Nations and the representatives of the three countries solely guarantee the peace process in continuous interaction with the Syrians to help the Syrians and provide the foundation for the constitutional committee, continued combatting terrorism, humanitarian relief, the return of refugees, the reconstruction of Syria, and the withdrawal of foreign troops from Syria. “In outlining the future of Syria, the ethnic and religious diversity of the Syrian society must be considered and respected away from pressure, threat, or interference of foreigners. The bitter experience of foreign interference in Libya and the collapse of the Libyan government and political system, and the experience of sending weapons and terrorism to destroy Syria is enough for the Syrian people and the nations of the region and the world to confront with any kind of foreign interference and pressure. As a democracy in the region, we believe that the path of democracy does not go through the gun barrel. Freedom is a social, popular, and national demand, and any kind of militarism creates a false sense of violence, whether in the form of terrorism or in the form of external interference. “Dear guests, the world, and especially our region, has paid a lot of human and material costs due to foreign interference and unilateral and adventurous policies of some governments, and the experience of the failure of foreign military interference in Syria in the past, outline the future status of the Yemeni crisis and other similar crises in the region, and the world. At the same time, the eradication of terrorism and military dominance alone cannot guarantee the continuation of stability and peace in the future of Syria and other countries facing crises in the region and the world, but rather the dialogue of the people of each country with the acceptance of the concept of national participation and the recognition of the diversity of different political and social approaches can be a reliable point for the future. “We have come a long and difficult way. Now, considering the bitter and sweet experiences of the past, we believe that there is still a not-so-short path to the end of the crisis. Facilitating the work of constitutional committees and the exchange of detainees, the return of refugees and designing a framework for healing the wounds of the people affected by the dark years of crisis and, ultimately, the reconstruction of Syria, are among the pivotal steps ahead. “About 15 months ago, Iran, Russia and Turkey shaped the Astana process in order to have further success in the fight against terrorism, to combat religious and ethnic differentiation; to shut down the flames of conflict and finally to bring about a comprehensive peace in Syria, and have seriously pursued it since then. Determining the four de-escalation areas to reduce tensions in Syria could, after 6 years, be able to cushion the conflicts in various parts of the settlement of the major part of the Syrian population and strengthen the will of the opposing Syrian parties to stop the conflict. “Here, I deem it necessary to emphasize the key role of the three countries in ensuring the Astana process. If the three countries did not have the necessary coordination, and if the Syrian government did not have the right cooperation with the Astana process, we would now face a much more complex situation in Syria. So today, in order to complete this process, we must continue our efforts to establish peace and stability in Syria. Certainly, the valuable role of the Astana process has created a good atmosphere for the United Nations to play its role in this regard. “Although some governments have been sabotaging the Astana process since the beginning, international initiatives to resolve the Syrian crisis have, directly or indirectly, benefited from the Astana process, and even some of the provisions of the Security Council had already been coordinated by the three guarantors in the Astana process. Although ISIL, al-Nusra and other terrorist groups have been seriously undermined and are on the brink of destruction, but unfortunately, some have continued to arm and use them, and have enabled terrorists to make their brutal acts against the Syrian people, including the residents of Damascus. The ongoing threat against the Syrian government for being subjected to foreign military action, the unceasing pressure to stop the crackdown on terrorist groups and the lack of attention to the balanced implementation of all paragraphs of Resolution 2401 has led to the ineffectiveness of this resolution and increased pressure on the Syrian people. Without a doubt, part of the pressure on the Syrian people is the result of the performance greedy western governments, especially the United States, in a way that one can unfortunately say that the lives, property, honor and the entire existence of the Syrian people are, in their view, something that is worthy only when their interests are in danger. “The U.S. government should answer the question of what it is doing in Syria, thousands of miles away from its territory. At whose invitation are American soldiers are present in Syria? US’ Illegal presence and military intervention in Syria is aimed at increasing tension and ultimately fragmentation of the country. Syrians, who were successful in the war against the terrorists, do not by any means allow foreign powers to break up their country and will resolutely fight this. “On the other hand, the Zionist Regime's daily support for terrorists in Syria and the violation of its sovereignty and territorial integrity have increased the complexity of the crisis. The international community should not be indifferent to these crimes and other crimes of the Zionist Regime, including against the Palestinian people who were recently slaughtered during peaceful demonstrations. “Since our previous meeting in Sochi, there have been important political and field developments in Syria. The most significant development in the political field is the holding of the first session of the Congress of the Syrian National Dialogue with the participation of representatives of various political and social groups on January 30, 2018 in Sochi and the final statement approved by the Congress, which, if the process of following up and implementation of the decisions are properly managed, in particular with regard to the formation of the committee for reviewing issues related to the reform of the constitution of Syria, can be taken as an effective step towards restoring peace and stability to Syria. In order to achieve this goal, it is necessary to ensure the implementation of the decisions made in the Congress and the formation of the committee in an atmosphere of understanding and cooperation by avoiding rush and imposing of the will of the foreign forces on the Syrian side. “The clashes in Eastern Ghouta and Afrin in northern Syria are among the most important developments in the field between the two summits of the Astana process. The first development with the new agreements has led to the withdrawal of armed groups from major parts of the region and can be a step towards restoring stability and stability to Syria with the help to maintain security in the capital and its residents. Developments in Afrin undermined the plans of some powers to exploit ethnic and racial differences in the path of fragmentation of Syria and other countries in the region, but it can help achieve our common goals in the Astana process only if it does not lead to violation of the territorial integrity and national sovereignty of Syria, and the control of these areas is at the Syrian army’s hand, which, despite current confrontations, remains the symbol of national sovereignty of this country. 1. The Syrian crisis does not have a military solution or one that is imposed from outside, and the future of Syria will only be achieved through democratic elections by the Syrian people. From the outset of the crisis, the Islamic Republic of Iran has emphasized the unacceptability of a military solution to the Syrian crisis and proposed a four-point plan accordingly. The Syrian National Dialogue Congress has provided a good basis for the start of the peaceful settlement of the Syrian crisis. The Syrian-Syrian dialogue should continue until a consensual solution, including the necessary amendments to the constitution and the holding of free and fair elections. The involvement of foreigners in determining the type and form of the Syrian government only continues the crisis. 2. The humanitarian situation throughout Syria is terrible, and the international community is committed to providing humanitarian assistance to all parts of Syria. In this regard, without violating Syrian national sovereignty, it must be ensured that the aid is delivered promptly and securely to all points where it is needed. The innocent Syrian citizens, whether they are in Ghouta or Afrin or Foua or Kefraya, must be supported by the global community. At the same time, real efforts to end the Syrian crisis and create the necessary grounds for reconstruction of the country and to provide the grounds for the return the refugees to their place of residence should be addressed by us and the international community. The Islamic Republic of Iran is ready to play an effective role in the reconstruction of Syria. 3. The sovereignty, territorial integrity, and unity and independence of Syria must be respected in all circumstances. The presence of foreign forces in Syria is illegal without the consent of the government and should be stopped and terminated. The greed of foreign powers for the land of Syria and the attempts to dismember that country is not acceptable under any circumstances and will endanger peace and stability in Syria. 4. It is essential to continue the fight against terrorism in Syria until all terrorist groups are eradicated. The countries that are still hoping for the victory of the terrorists in Syria must come to their senses, and do not put themselves against the Syrian people by stopping helping terrorist groups. “President Rouhani, President Erdogan, colleagues, First, I would like to thank Mr Rouhani for the invitation to hold our trilateral meeting here in Tehran to discuss further joint steps by Turkey, Iran and Russia related to Syria. “Let me note that the decisions made at the previous summits of the states–guarantors of the Astana process are being successfully implemented. “We have made substantive progress in providing long-term normalisation in Syria. The stronghold of terrorism has almost been eradicated. More than 95 percent of Syrian territory has been liberated, 141 residential areas. “Currently, the remaining extremist groups are concentrated in the de-escalation zone in Idlib province. “Terrorists are making attempts to torpedo the ceasefire, and, moreover, to prepare and carry out various provocations, including those that involve chemical weapons. “We can say with confidence that all the opportunities have been created for Syrians to determine the future of their country themselves. “In this context, I propose discussing further plans to implement step by step the decisions of the Syrian National Dialogue Congress held in Sochi this January. First of all, I am referring to establishing and launching the Constitutional Committee in Geneva, under of the auspices of the United Nations. “To achieve stable normalization it is necessary to facilitate the improvement of the socio-economic and humanitarian situation in Syria. Peaceful life is being gradually restored, security is being enhanced and civilian employment is growing on the territories returned to Syrian government control. “In this context, Russia proposed an initiative on international assistance in the return of the refugees and internally displaced persons to Syria. We are pleased to say that this initiative enjoys support from our Iranian and Turkish partners. “I would like to mention that along with the Centre for Refugee Reception, Allocation and Accommodation in Damascus, Moscow has established Interdepartmental Coordinating Headquarters. In addition, checkpoints have been opened on the border with Jordan and Lebanon. Over 15,000 people have returned home in a month and a half. “Russia is directly helping Syria on a regular basis by delivering food, medicines and other cargo to areas that were the hardest hit by military actions. “Overall it would be useful to be consistent in our joint actions in the humanitarian area so as to help Syria rise from ruins, restore its industry, agriculture and infrastructure, thereby making it possible for the Syrians to return home in large numbers. “We are in agreement for restoration of Syria’s territorial integrity, prevention of bloody conflicts and reconstruction of the country’s future. The losing party of the ongoing crisis and conflicts is the Syrians.